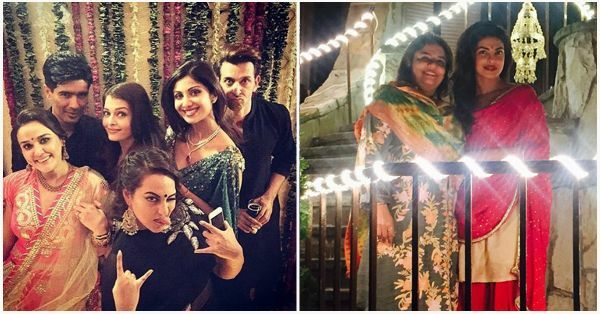 #Aww: Our Fav Celebs Posted The Most ADORABLE Diwali Pics! 2. Deepika and Ranbir celebrating in Dilli with full swag! With phooljadi, rangoli and a lot more tamasha! 3. Priyanka Chopra put up this adorable picture up with her mum while celebrating Diwali away from home in Montreal. Aww! 5. We're SO in love with Jacqueline's look this Diwali! She looks like an absolute princess, don't you think?! 6. Look at these goofs, Siddharth and Aditya! Smirking away to glory and stuffing their faces at the same time. We still think they look totally adorable, though! 7. Diwali isn't completely without a total pataka type photo with your besties! Look at Kareena, Amrita and Malaika setting up some #BestieGoals for us! 8. Sonakshi Sinha being her badass self when she photobombed this selfie full of some awesome B-Town celebs! MUST-READ: #CelebSmash: Our Fav Celebs Dance To Prem Ratan Dhan Payo! MUST-READ: 7 Celeb Kids Who Are Sure To Take Bollywood By Storm!